Nintendo of America have announced the latest content to be made available through the Wii Shop Channel, Nintendo DSi Shop, Nintendo eShop on Wii U and Nintendo 3DS. Runner2 is a rhythm-based, auto-running platformer with five exciting worlds, 125 tantalizing levels and five death-defying boss battles. Play as eight different characters and find secret areas to unlock new and zany costumes. 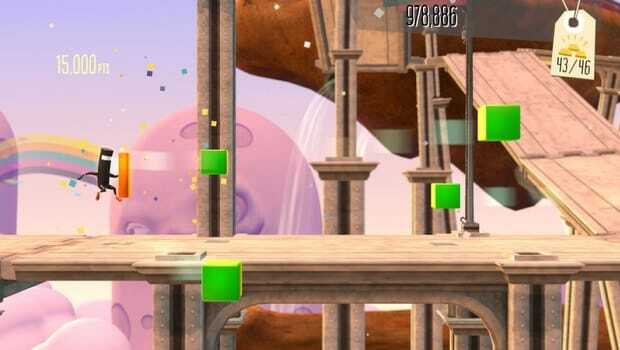 The full and demo versions of Runner2 are now available in the Nintendo eShop on Wii U. Cruise through the open-world in stolen vehicles while outrunning the law and mowing down fellow citizens! Jump on pedestrians for coins, or use them for target practice with over 25 weapons and power-ups! WHOA! Fractured Soul is a classic side-scrolling platform game with a twist: it is played across both screens at once! Created by platform gamers for platform gamers, and exclusively for 3DS, Fractured Soul literally adds a new dimension to this much-loved genre. Build your own roller coasters using fast and intuitive touch screen drawing and editing controls. Then jump right into a coaster cart seat to experience the ride in thrilling 3D. Use the Track Wizard to add Loops, Corkscrews, and Twists. Take Mii characters for a ride on your coaster. Share your coasters with friends. Accompany the famous adventurer David on his most mysterious mission yet – the one that will change everything! Follow the trail of ancient heroes, past the Oracle of Delphi and the Theatre of Dionysus to experience the mystery of the Gods of Olympus! Discover the treasures of this once magnificent culture. Don’t let your guard down though: you’re not alone! Set 25 years after the events of Castlevania: Lords of Shadow, this new game reveals the story of Gabriel Belmont’s descendants, as they battle their own destinies to discover their true, shocking fates. Castlevania: Lords of Shadow – Mirror of Fate allows players to select their own character as they battle massive bosses and traverse tricky obstacles. The game combines classic side-scrolling game play with unrivaled 3D visuals only possible on Nintendo 3DS. Everywhere in this amazing Easter Wonderland is crammed full of Easter Eggs, Bunnies, Candy and Fabulous Toys. Mom takes Mike and Sally to get fresh laid eggs from the Farm, then they they come home to paint them. Meanwhile, the Easter Bunny runs past and leaves eggs all over the backyard for them to find. Next, the family go downtown to the Shopping Mall, then visit Auntie Janet’s house, before going to the nearby Church for the ultimate Mega Easter Egg Hunt.